View west along Maryland State Route 586 (Veirs Mill Road) in Wheaton by Famartin licensed under Creative Commons. A version of this article first appeared in WashCycle. Planners in Montgomery County want to make Veirs Mill into a complete street, with amenities for all kinds of users including Bus Rapid Transit (BRT), sidewalks, a grade-separated crossing of the Matthew Henson Trail, and a bikeway. However, Montgomery County Council Deputy Director Glenn Orlin, in a memo to the council's Planning, Housing, and Economic Development Committee, says that will all be too expensive and will make driving worse. Orlin, who writes analysis memos about budget and legislative proposals related to transportation for the council, states that complete streets are an "urban" thing and that Veirs Mill is a suburban major highway. Any changes to make it more pedestrian or transit-oriented, if they harm drivers, are a real problem, the memo says. The largest items are for their assumed County's costs to construct Veirs Mill Road Bus Rapid Transit (BRT) Alternative 2.52 ($39.6 million) and, ultimately, to include continuous BRT lanes (Alternative 3, another $34.4 million); and grade separating Veirs Mill Road over the Matthew Henson Trail ($44.4 million). The $56.9 million balance is almost entirely for a host of other bicycle and pedestrian improvements. 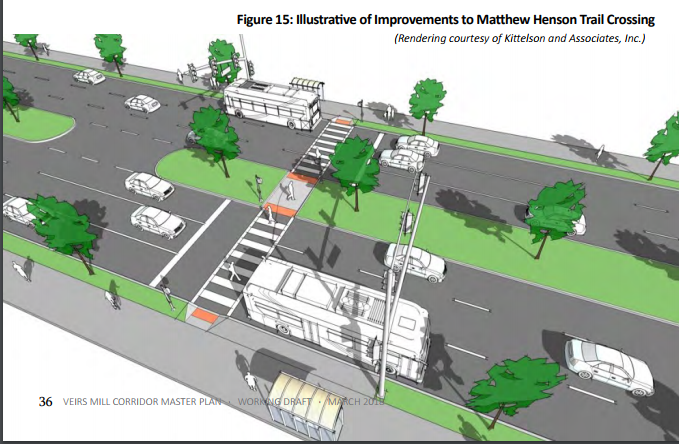 The FIS notes that if the Matthew Henson Trail were bridged over Veirs Mill Road instead of vice versa, the grade separation cost would be $11.2 million, bringing the overall County cost down to $142.1 million. One of the staff's big criticisms of the complete streets proposal is that vehicle delays will become too long—more than two minutes per vehicle in some cases—as defined by the county. Planners suggest that the county should accept longer delays in order to get safer streets. County staff recommend against because...allowing more congestion will lead to more congestion. 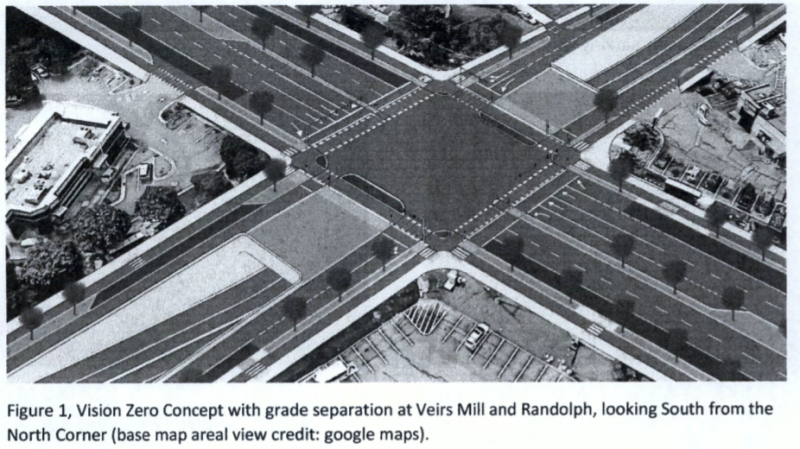 Elsewhere, the Draft Plan recommends removing a master planned diamond interchange at Randolph Road because "A grade-separated interchange at this intersection is inconsistent with the overall transportation goals of this plan, which seek to improve conditions for pedestrians, bicyclists and transit users on Veirs Mill Road and the surrounding communities." However, county staff recommend against that because the interchange will reduce congestion. They recommend the design below because it will break up the crossing distance for pedestrians and cyclists, and more efficiently use land. The Draft Plan recommends removing double-left turn lanes because of safety concerns. County staff recommends against that too, on the grounds that it would cause congestion. County staff also recommend faster design speeds, more channelized right turn lanes, and wider lanes, all contrary to the Draft Plan recommendations. They also state that "where there is a frontage street that it serve as the bikeway on that side of Veirs Mill Road, at least in the short term" instead of installing a protected bike lane. It's important to note that people do walk, bike, catch buses along these "highways," and people are dying every month in part because of unwillingness to look at them as anything but high-speed arteries. There was a community-driven process for this new master plan, and residents living in these "suburban" communities requested the changes. It does look like these changes will be expensive. But if we start arguing that traffic sewers are popular and important ways to deal with congestion and therefore we can't change them, then we're just deciding to have traffic sewers forever. No one said Vision Zero was going to be cheap.